Summary: If you want your horror to have a bit of Brains as well as blood and guts then you might find Switchblade Romance to be somewhat disjointed but this is more than compensated for by what is one of the finest shockers of 2004. Alexandre Aja’s Haute Tension, or Switchblade Romance to give it its British moniker, does exactly what it says on the can, albeit in French, and viewers should expect tension of the highest order throughout. Aja’s directorial proclivities toward outright horror will be familiar to those among you who have had the pleasure of watching his recently released The Hills Have Eyes and Switchblade Romance is cut from the same blood-soaked cloth. Cécile De France plays Marie, who at the outset of the film is found to be visiting her friend Alexia (Maïwenn Le Besco) in the French countryside. This film is not for the faint of heart and the relatively playful and coquettish opening scenes only serve to lull the audience into a near fatal sense of security. From the moment the killer arrives at the farmhouse door Switchblade is a brutal and frenetic assault on the senses. The familiar horror scenario of being trapped in the isolated house is played out to good effect and the gory violence is genuinely stomach churning in places. Marie finds herself trapped in her friend’s quaint country home as the anonymous killer stalks from room to room slaughtering her family in a surprisingly shocking fashion (trust me you’ll never look at a chest-of-drawers in the same way again !). Aja succeeds in capturing the essence of the slew of American slasher movies that have dominated the horror genre of late while also building on the conventions and connotations of ‘pure’ horror. The visual motifs of classic horror are all present recombined in a funky French veneer lending the film an air of credibility. The implausibility of the teen-slasher is ever-present as the female protagonist, Marie, makes all the text book errors such as hiding upstairs under the bed and walking into poorly lit areas while breathing heavily, however, this doesn’t distract from what is a genuinely scary and tense horror. 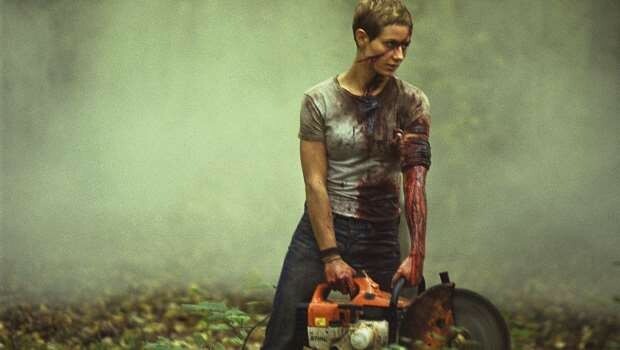 Aja proves to have an aptitude for creating palpable terror throughout the film and, where as the opening scenes are all hide-and-seek, the latter scenes descend into woodland chases involving circular saws. This is where Aja’s direction is at its best, in building a story based on the pre-established conventions of the slasher movie he takes the audience through a myriad of tense and chilling encounters than never fall foul of predictability. There are some holes in the story, however, which isn’t really surprising considering the fairly liberal use of sharp objects. The plot itself is founded on the unrequited lust Marie has for Alexia and the audience are asked to do some fairly extensive connect-the-dots as far as the characters and story are concerned. This could normally be overlooked were it but for the climactic scenes which, in an effort to shock, come off as merely nonsensical and a discredit to the film as a whole. There is also a lot of the story that depends on Marie’s psycho-sexual frustrations which would require a more lengthily introduction to our heroine than we are granted. If you have a forgiving disposition when it comes to your horror then you will probably find this to be an enjoyably horrific jaunt through the French countryside. If you want your horror to have a bit of brains as well as blood and guts then you might find Switchblade Romance to be somewhat disjointed but this is more than compensated for by what is one of the finest shockers of 2004.